You put a lot of time and effort into choosing the perfect Murphy Bed. The color, texture and style all match your décor, but then – there is that old-school steel leg. Sitting there, like a sore thumb. We can book an airline ticket with our phones, but can’t get rid of that ugly steel leg that keeps tripping up your guests? 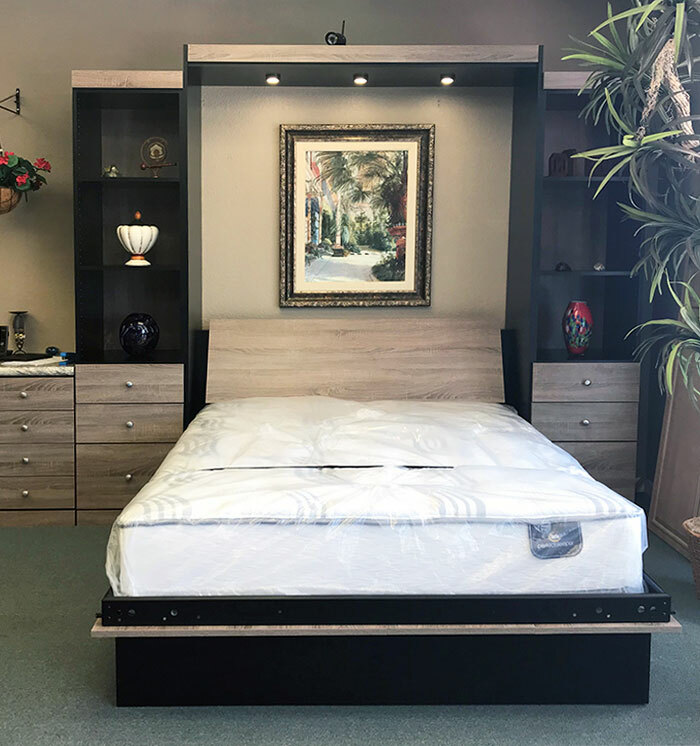 Millers Murphy Bed is proud to announce a solution to your décor drama. We’ve gotten rid of that ugly steel leg and replaced it with a modern, sleek support leg and shelf combo. When the bed is closed, you can place your collectibles on the matching shelf with accent lighting. When guests arrive, simply pull the bed open (after removing your collectibles.) The shelf functions as a very sturdy support leg and is placed away from the panel edge. No more trips or stubbed toes!